Why Make Your Account White Label? Domain-branded video landing pages, and much more. EZWebPlayer’s White Label Custom™ allows you to avoid the enormous cost of platform development - you simply "skin" (customize) our site to look like yours. You can use our technology for your own needs while you resell it. Reach out to your viewers with your own custom logos and messaging. Choose to deliberately brand your players and your video web page with a seamless message of professional stature. Every video, every view with your identity. We at EZWebPlayer develop the software to give you right-featured video hosting and playing services with personal customer service at an affordable price. And we partner with Amazon Web Services to deliver our platform. We chose Amazon because of their deep and broad infrastructure. You get Amazon's S3 and CloudFront with unlimited storage, cloud-based lightning-fast speeds, and reliable 24/7 deployment. The right services, the right delivery system — that's convenience, quality, speed, and security other video platforms can't match. Other video platforms place their name on their players. Example: Videos hosted on YouTube display "YouTube" on the player's frame. It's simply more professional to display YOUR domain name/logo on your player…or none at all. It allows you to own your content and the player, instead of the other way around. Create totally customized player pages WITHOUT coding. 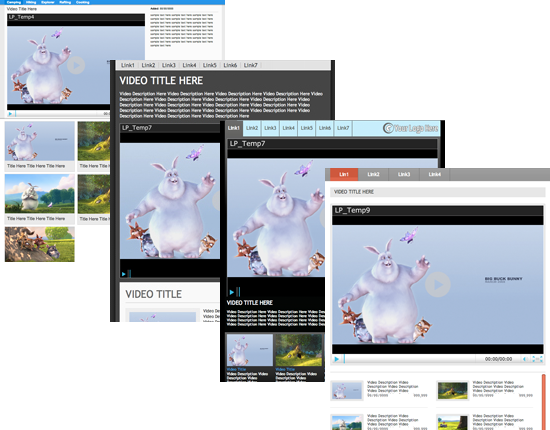 Instantly turn a QuickView page into a Video Landing Page. Add custom text, graphics, colors, designs. Add a call to action, add links. It's easy. 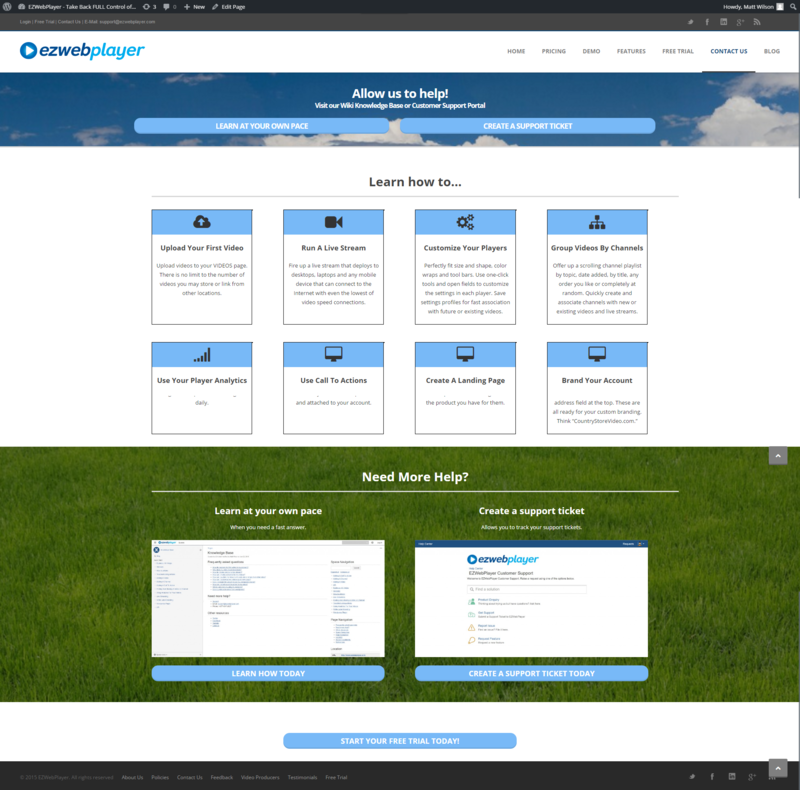 Custom Landing Pages are only available at EZWebPlayer. Click here for more details. With White Label Custom, you can stream live events to up to 200 viewers at a time. Live stream meetings at your home office to your field staff. Live stream presentations, sports events, podcasts, webinars, conferences, educational classes graduation events — virtually any event. Need more than 200 users? Talk to us about streaming to UNLIMITED audiences for affordable fee. Upload a video file using White Label and we "transcode" it seamlessly in the background: we code your files in two formats. One file is created with HD quality for those who view your video on their computers; the other for viewing on mobile devices like smart phones and tablets. Result: your viewers watch your videos in highest possible quality their devices can receive. There's NO LIMIT on how many videos you can host on your White Label plan. Virtually No limit on monthly bandwidth. No limit on super-dependable Amazon S3 Storage. No limit on transcoding. And no limit on the number of QuickView Video Landing Pages you create. We partner with Amazon – one of the most solid and trusted providers on the planet. 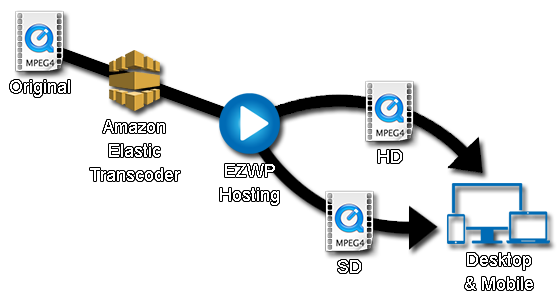 With White Label, you get lightning fast streaming and reliable storage of your valuable videos. We created EZWebPlayer from scratch. Should you need tech support at any time, please email us — we know EZWebPlayer inside and out and if the question you have requires more than a simple email, we will quickly setup a live call. Owning your own video platform opens sales doors and profit opportunities. Brand EZWebPlayer as your own and resell it using our White Label Custom plan. See how EASY it is to use White Label…and SAVE 10%! Sign up now and SAVE 10% on a yearly subscription to EZWebPlayer. Start leveraging true enterprise level video hosting and sharing technology immediately!